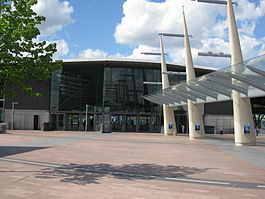 North Greenwich is a London Underground station served by the Jubilee line. Despite its name, it is not in the locality historically known as North Greenwich, on the Isle of Dogs, north of the River Thames; an entirely different North Greenwich station used to be there, between 1872 and 1926. 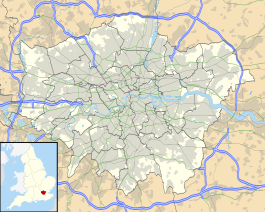 It is actually closer to Charlton than to Greenwich, however, it is at the northernmost tip of the Royal Borough of Greenwich, which perhaps provides the best explanation of the name. The tube station was opened in 1999. It is adjacent to The O2 (formerly the Millennium Dome) at the northern end of the Greenwich Peninsula, on the south bank of the Thames. It is the easternmost below ground station on the line. It lies between Canary Wharf and Canning Town on the Jubilee line, in Travelcard Zone 2 and Zone 3. An Underground station was first proposed for the Greenwich Peninsula in a government report on the redevelopment of London's Docklands published in 1973. The proposal, part of the then unbuilt Fleet line, proposed a line running from Charing Cross via Fenchurch Street to Beckton, with stations on each side at Millwall and Custom House. The proposal was developed during the 1970s as the Fleet line developed into the Jubilee line. The route was approved in 1980, but financial constraints meant that the route was not proceeded with. By the start of the 1990s new plans had been developed to extend the Jubilee line on a route south of the River Thames towards Stratford with North Greenwich station built in accordance with this plan. Opened on 14 May 1999, North Greenwich is one of the largest stations on the Jubilee line, capable of handling around 20,000 passengers an hour, having been designed to cope with the large number of visitors expected at the Millennium Dome (now The O2). The track at North Greenwich was designed to facilitate a branch of the line from this station. A branch towards Thamesmead was planned; however this has not been developed beyond the initial proposal, and is not currently in Transport for London's investment programme. The track layout allows trains from both Stanmore and Stratford to terminate at North Greenwich. A number of trains from Stanmore terminate here during peak and off-peak times, and enter platform 2 instead of the usual platform 3. Trains head back towards central London from platform 2. During times of disruption and engineering work, trains from and back to Stratford can be routed into and out of platform 2. The striking blue-tiled and glazed interior, with raking concrete columns rearing up inside the huge underground space, was designed by the architectural practice Alsop, Lyall and Störmer. The blue tiles on walls were inspired by the design of MTR stations in Hong Kong, where every station adopts a livery in order to help passengers to recognise their alighting stop. As with other stations on the Jubilee Line Extension, all platforms are equipped with platform screen doors. On 20 October 2016, police conducted a controlled explosion on an improvised explosive device at North Greenwich after a passenger spotted an unattended bag filled with "wires and an alarm clock" aboard a Jubilee line train. No injuries were reported, and a suspect was later detained. The man, Damon Smith, was convicted of possession of an explosive substance with intent and was sentenced to 15 years' imprisonment. The bus station is interconnected and above the tube station on the surface for direct transfer with London Buses routes 108, 129, 132, 161, 188, 422, 472 and 486 serving the station. The Emirates Air Line cable car opened nearby on 28 June 2012, providing a link between the Greenwich Peninsula and the Royal Victoria Dock and ExCeL London. ^ Horne, M: The Jubilee Line, page 79. Capital Transport Publishing, 2000. ^ "North Greenwich Underground Station". Commission for Architecture and the Built Environment (CABE). Archived from the original on 18 January 2011. Retrieved 21 January 2013. ^ Kenneth Powell Jubilee Line Extension, Laurence King Publishing, 2000. ^ "North Greenwich Tube terror scare sparked by 'bag full of wires'". Evening Standard. 21 October 2016. Retrieved 21 October 2016. ^ "Counter terrorism arrest over North Greenwich Tube device". BBC News. 21 October 2016. Retrieved 21 October 2016. ^ Metro.co.uk, Ashitha Nagesh for (21 October 2016). "Man arrested on suspicion of terrorism over 'device' at North Greenwich station". Metro. Retrieved 21 October 2016. ^ "Damon Smith jailed for planting failed Tube bomb". BBC News. 26 May 2017. Retrieved 26 May 2017. ^ "Boarding passes ready as first Emirates Air Line flight takes off". Transport for London. 28 June 2012. Retrieved 30 June 2011. This page was last edited on 30 January 2019, at 11:52 (UTC).